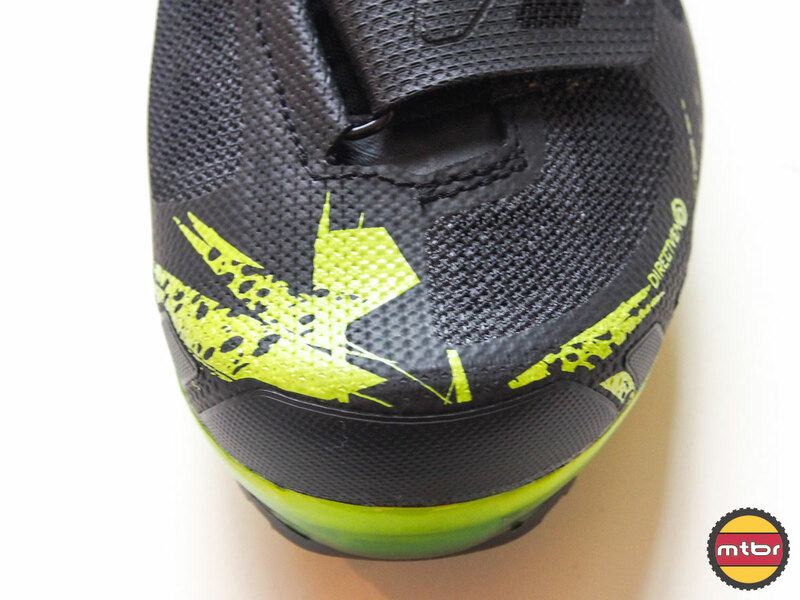 It’s been a long time in development, but we finally have a production version of the much-ballyhooed Pear Izumi X Project mountain bike shoes in our hands. 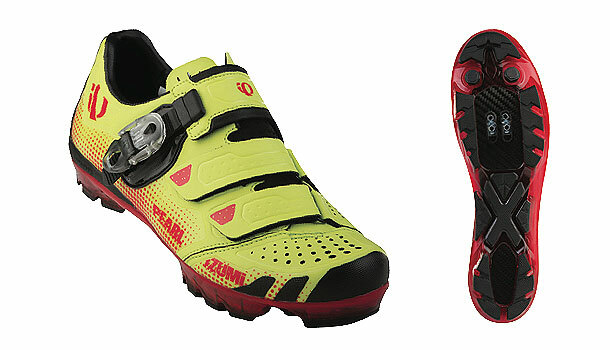 For those who don’t recall, these shoes were first launched at a Press Event back in November 2012, but didn’t actually make it into their consumer catalog until this fall when Pearl Izumi started showing them off more widely during trade show season. We haven’t had a chance to do a whole lot of testing yet (there is snow on most of our Colorado trails), but wanted to pass on some photos and a few initial impressions. First up was a trip to the scale. 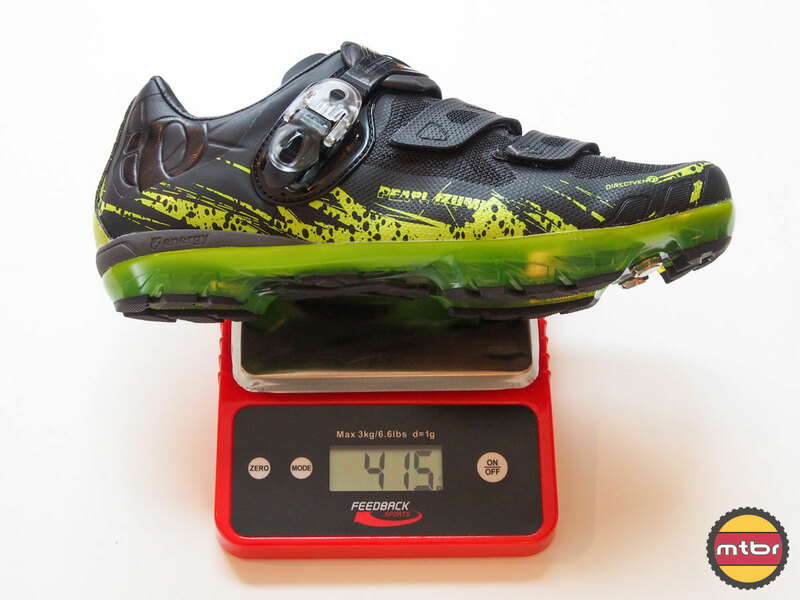 Our test pair of top-of-the-line X Project 1.0’s (size 44) weigh 415 grams per shoe, which is 95 grams more than what is listed in the catalog, which presumably refers to a smaller pair, though it doesn’t say. 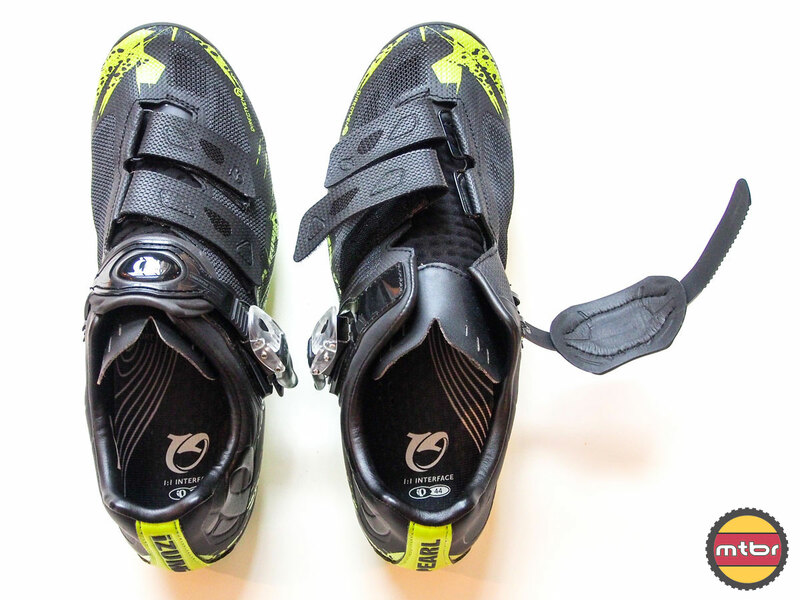 For comparison sake, that’s 20 grams heavier than the 395-gram per-shoe weight of the size 44 Louis Garneau T-Flex LS-100’s that we’ve been testing this fall (see them in our Cyclocross Gift Guide). 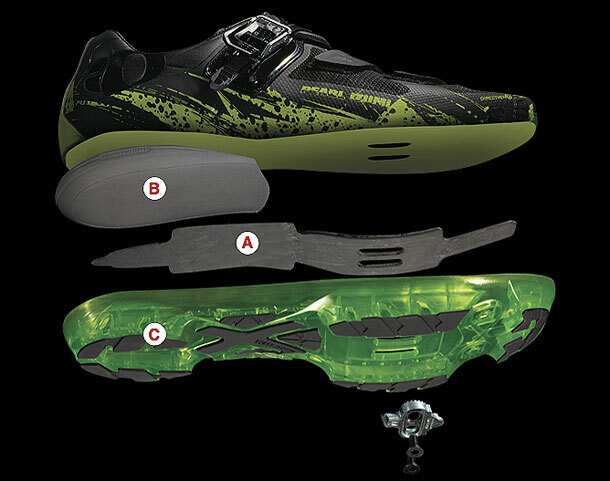 But granted the Louis Garneau shoe is billed as a lightweight offering, and uses a BOA closure system plus one small strap, where the X Project utilizes a traditional three-strap closure where the two lower straps are attached at 25-degree angles, which better follows the natural contour of a foot, helping alleviate hot spots. 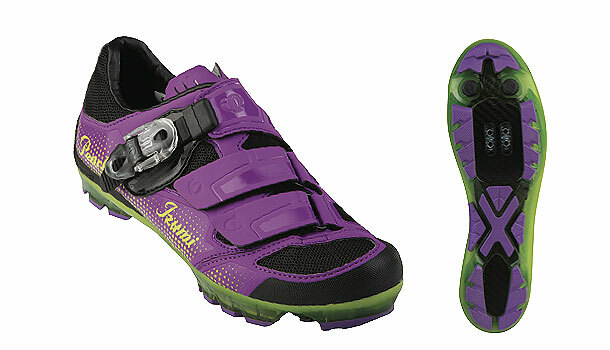 It’s also worth noting that weight is not among the features that Pearl Izumi is trumpeting with its new shoe. This is a sole story all the way. 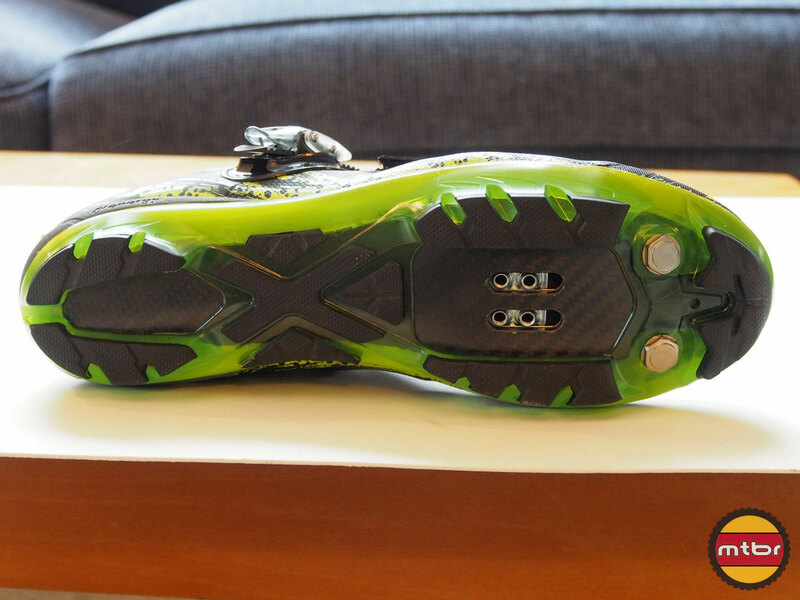 That story, in case you’ve missed it, is that basically the X Project’s carbon sole is flexible in the right places for walking or running, but otherwise rigid and efficient due to its patent pending carbon plate technology. During a very basic walk-around-the-room test, the off-bike flex was very noticeable, as was the fact that you can achieve a very secure heel fit, at least with my slightly narrow size 10US foot. Whether it will also deliver the advertised on-bike stiffness and efficiency remains to be seen. But we’re planning to use them for a few upcoming cyclocross races (including the master’s national championships in Boulder, Colorado, in mid-January) and will have some more thorough analysis afterwards. Pearl also provided a final price breakdown of the complete line. The X Project 1.0 ($280) has a carbon sole, seamless lightweight upper, is very breathable and is the lightest of the three. 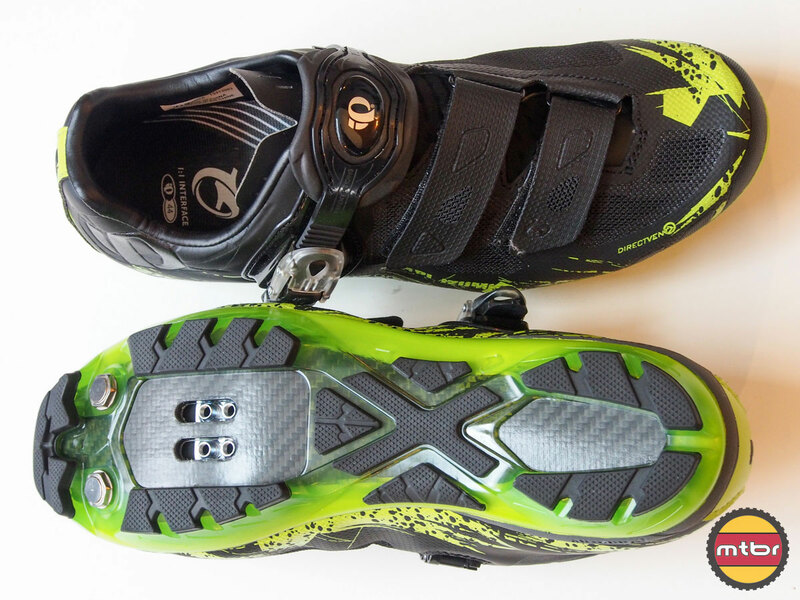 The 2.0 ($210) uses the same sole as 1.0, but has a “more robust upper that offers more protection with less ventilation,” making it Pearl’s pick for cyclocross or general mud riding. 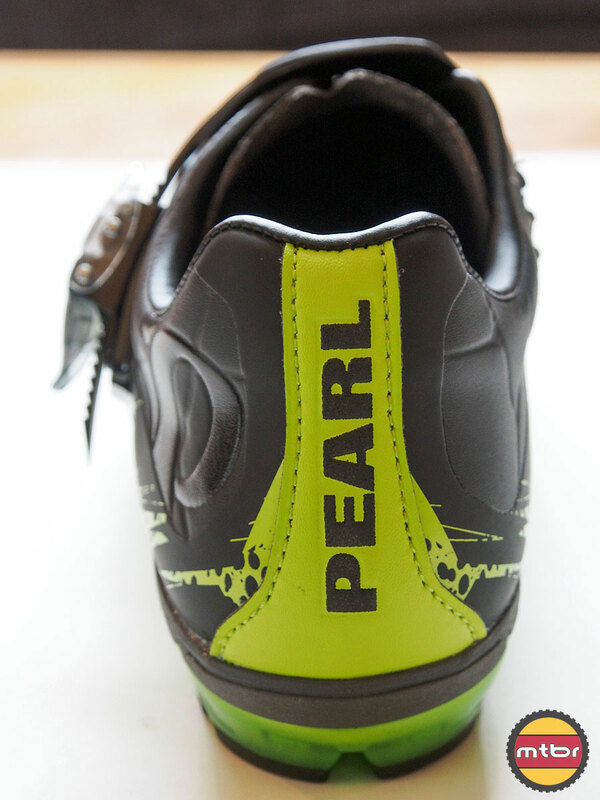 And finally there’s the fiberglass sole 3.0, which Pearl calls, “light and breathable upper, but not as sophisticated as the X Project 1.0.” It sells for $160. 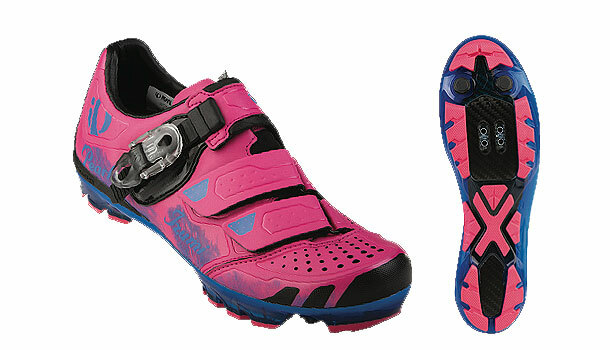 The X Project also comes in two women’s versions, the W X Project 2.0 for $210, and the W X Project 3.0 for $160. There is no 1.0 women’s version. Sizes for the men’s line range from 38-47 with 1/2 sizes, plus a 48 and a 49. Women’s sizes run 36-43 in 1/2 sizes. There are no wide versions at this point. Each pair comes with two sets of varus inserts (1.5mm and 3mm) and arch inserts (thin and thick) to help the wearer achieve an ideal fit. We’re still playing around with these, but will let you know in a follow-up post what works best for us. Lastly we must mention color, which is also a big part of the X Project story. 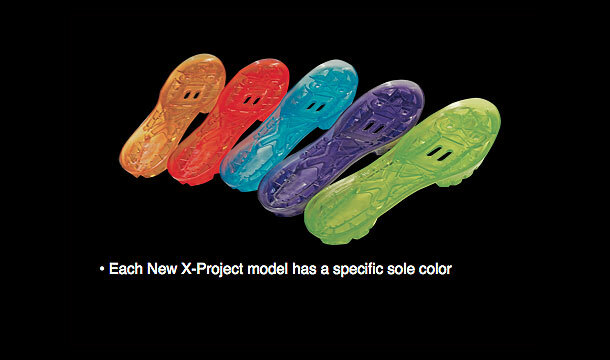 Each shoe gets its own sole color (see above). And if you think those are bright, check out some of the color names used in the upper material of various models, which includes electric blue, fiery red, lime and dazzling blue. Yes, they are all as bright as they sound, which you can see for yourself in the gallery below. We’ll leave it at that for now, and check back soon with some more detailed test analysis. In the meantime you can learn more at pearlizumi.com. 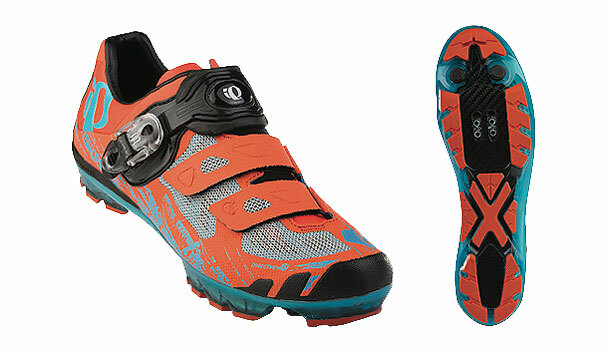 Do you own Pearl Izumi X Project 1.0 shoes? Help us become a better resource and write a review! “…no wide…” and moving on. 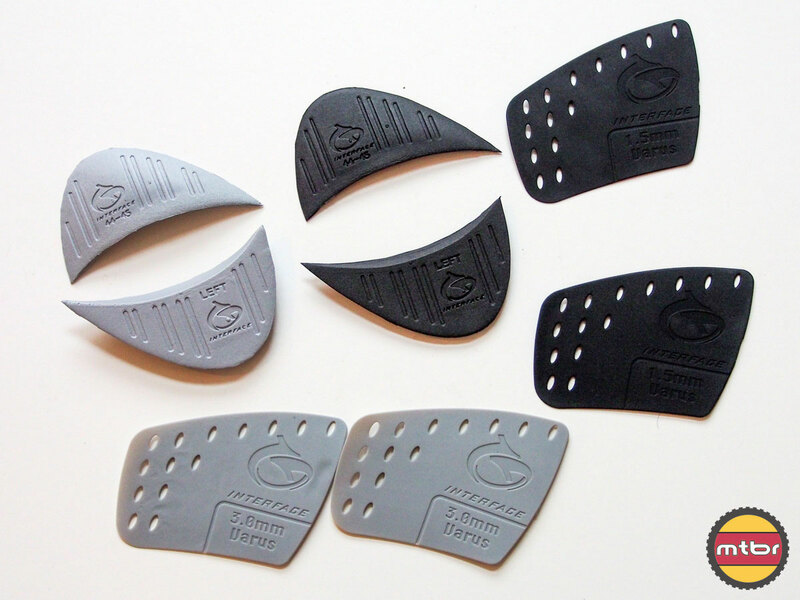 The rubber traction material that’s between you and the rest of the shoe wears away really quickly should you walk many feet in them. My pair lasted 66 rides in Sedona where the only off the bike use was negotiating the tech sections I was unwilling to ride. I contacted PI and was told that my problem was wear and tear and my responsibility. 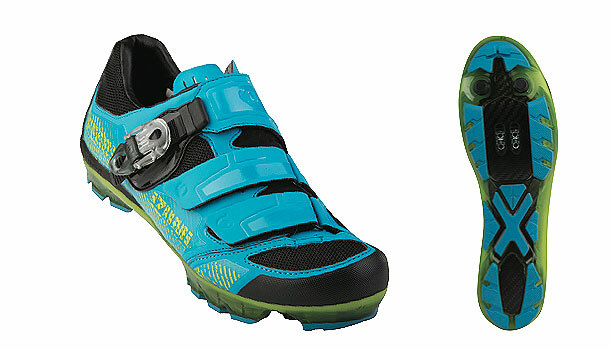 I later learned from a PI store that the shoes are suited for cycle cross. They offered the X Alp Launch shoe as a replacement that appears to be better built. 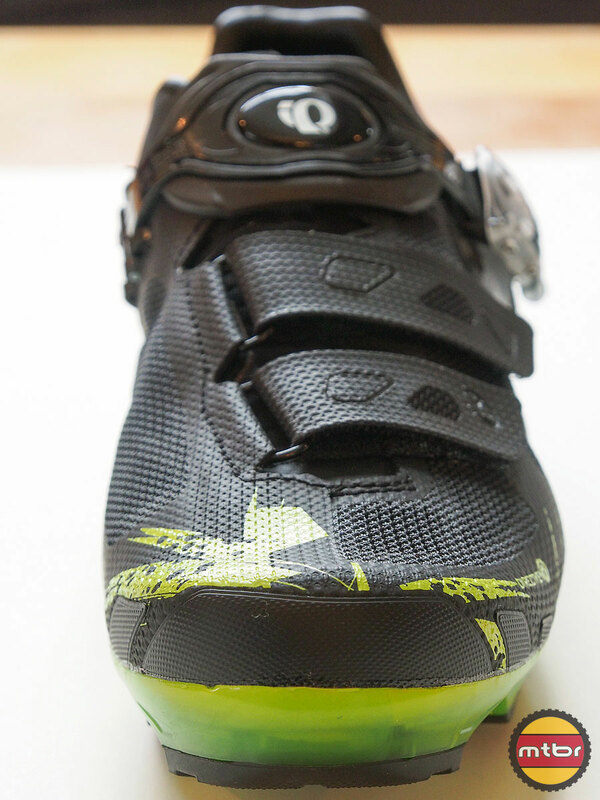 I built up the worn away traction material w/ shoegoo that lasted for several rides.